Decorative Mexican tile is a colorful option when a project to remodel a vanity, a backsplash or a shower is in your mind. We recommend to be careful when deciding what color combination you think it will be the best for your project. Maybe the most important phase is to decide your color palette and from there start selecting what tile combination will be to most charming to you. Remember you are going to live with your choice for a few years to come. 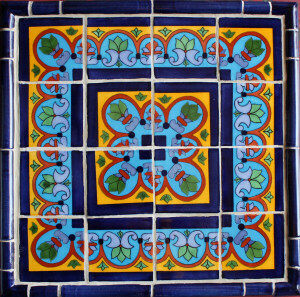 We have found that Fine Crafts Imports has a wide variety of Mexican tile options. Based on a lot of projects we have worked on, we recommend to use the Mexican decorative tiles as accents and use a field tile which is usually a solid color. Adding accents such as borders, diamond-shaped spots, or frames is the best conservative choice. Attached are a few pictures that you can review and have as references. Most of them are based on the premise of using a solid tile as a field tile and a decorative one as accent. 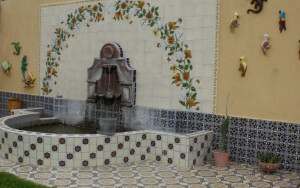 Most of Mexican tile is not frost-proof and can’t be used inside pools. If somebody tells you that can be used inside pools, just ask them for certification. The main reason why we don’t recommend Mexican tile inside pools is because chlorine destroys the clay. Most of the Mexican tile is handmade and hand-pressed, and as such its hardness might not be as strong as a compressed version of it. It can be used as decorative option inside showers, backsplashes, counter-tops, bathrooms, kitchen, outdoor BBQs, fountains, floor accents and more. Mexican tile murals can be used as backsplashes very common in kitchens. Tile murals can be fully drawn versions of a landscape or it can be just a set of repeated patterns, which usually can create fancy patterns too. The images shown are just a few examples of this case.